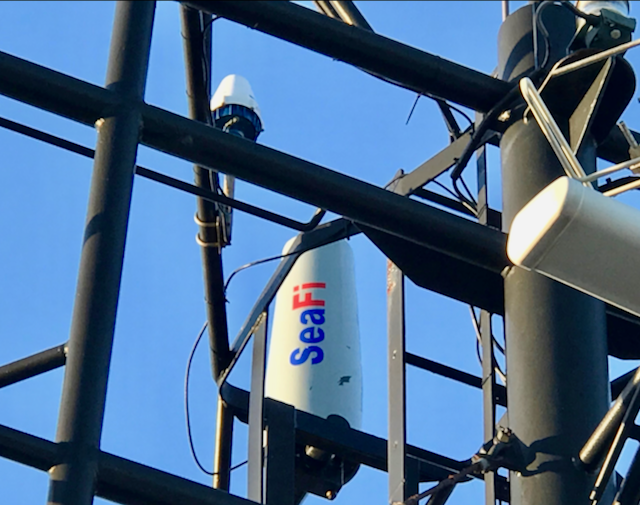 SeaFi – SEA-Tech’s revolutionary maritime wifi service – has been identified as a potential challenger for the world record for the longest wireless broadband transmission at sea by Guinness World Book of Records. The record will be attempted between OSV Ocean Spey (owned by Mainport) and Roches Point lighthouse (owned by Commissioners of Irish Lights) on June 6th and 7th, 2018. Watch this space! My name is Bianca Gedorio and I’m a college student in Cork College of Commerce, studying Computer Science. For two weeks, I am working for Sea-Tech. I began my internship/work experience, as a technical support junior technician, on the 15th January and I enjoyed the amazing learning experience! Arnaud Disant, the Chief Technical Officer, has taught me a wide range of knowledge in both technical and life skills in a span of just two weeks! Today well over a million men and women live in the twilight world of big shipping (Source SCFS). They are responsible for most of the goods you will be consuming over the Christmas season. It's a lonely life. They don't get to spend Christmas with the family. They roam the world's oceans for up to 12 months at a time. They come from more than 100 different nations and speak dozens of language. For most of them accessing the internet is synonym of keeping in touch with the family. DO YOU HAVE A KNACK FOR MARINE TECHNOLOGY? The annual National Maritime College of Ireland - Open Day will take placeI on Thursday, 26th October 2017 from 10:00 to 15:00 and this year again, SEA-Tech will be representing Marine Electricals and Electronics... So if you have a nack for marine tech, this is the place to be... A SEA-Tech marine ICT Engineer will be present on our stand all day to answer questions both on Marine ICT and Electro Technical Officer on board ships as a carreer path. At the time writing this gusts are almost 100 km / hours in Rochespoint. SEA-Tech workshop at Cork Airport is operating on generator, some elements of SeaFi Port of Cork have stopped responding we won't know why untill the storm is over. SEA-Tech Evolution is developing SeaFi as an alternative to Satellite and Long-Term Evolution (LTE) a.k.a. 3G/4G with a view to improve IoT on board ships. SeaFi is already available in three major ports in Ireland - Cork, Waterford and Rosslare. With support from Stena and Rosslare Europort, SEA-Tech has equipped MS Stena Horizon with state of the art long distance wireless communications.